Green Arrow Vol. 9: Outbreak demonstrates the strong effect the artist can have on a book. Writer Benjamin Percy pens the whole volume, but he's joined in various parts by artists Szymon Kudranski, Patrick Zircher, and Otto Schmidt, and there is great variance in how well these parts work. 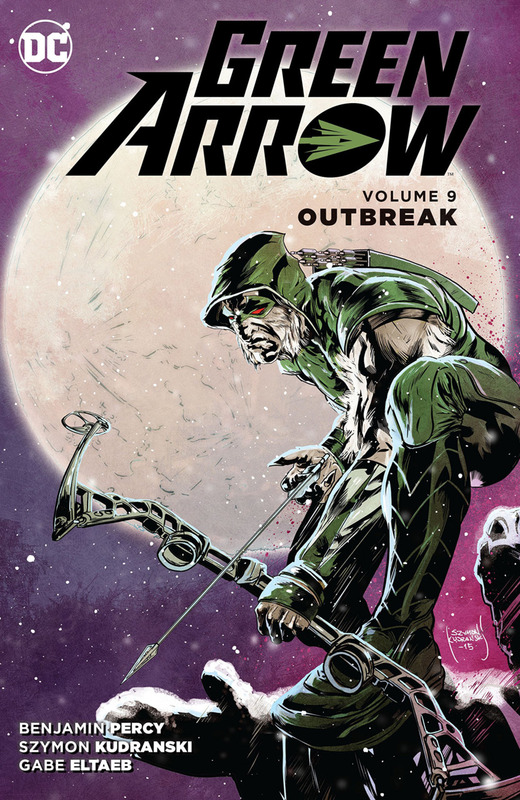 I did not enjoy Outbreak as much as I did the previous volume; however, included here is Percy's Green Arrow: Rebirth special, and if that's any indication, Percy's next book should be a lot of fun. In some respects Percy gets away from the core of Green Arrow here in this tale of Oliver Queen turned essentially into a werewolf. The narration itself acknowledges the oddity of usually-non-powered Oliver temporarily gaining super-powers. Though Percy crafts the story as a metaphor for discrimination and social conflict of a kind inherent to Green Arrow, it's strange that Percy waited until his second volume to do this kind of "establish what the character isn't to determine what he is" story, more often found in a new series writer's initial outing. Green Arrow Vol. 8: The Night Birds was much more faithful to the historic core of the character hearkening back to the 1970s and 1980s, and it's perhaps only Outbreak's proximity to Rebirth that contextualizes exploring what Green Arrow isn't before the relaunch gets back to what he is in the extreme. But inescapably, the majority of this story that did not work for me was drawn by Szymon Kudranski, and the one chapter of the same storyline that I felt had some actual excitement to it was the one drawn by Patrick Zircher. I wholly recognize that Kudranski's distorted, shadowy work is just right for a werewolf story, strongly reminiscent of Kelley Jones before him. At the same time, I've long felt that Kudranski's figures have a distracting tendency to be looking past and not at one another, and the panel backgrounds lack detail more often than not. I have the sense in looking at these pages of consciously looking at art, whereas with Zircher I'm better able to get into the story -- it's happening, rather than that I'm looking at it happening. To that end, I'm unsure if Percy's Outbreak doesn't work, or if I'd have been as impressed as with Night Birds if Zircher had drawn the whole thing. Outbreak lost me in the third chapter where Oliver notices a gangster during a business lunch and can't help but attack the man, sprouting claws and fangs and pointed ears in the process. I'm willing to grant in the process of fiction that those infected with the story's "Lukos virus" for long periods of time gain lupine features, but Oliver's sudden change (and reversion) doesn't make in-story sense. I don't think the supernatural is an especially good fit for Green Arrow, and so I appreciated that Percy offered a medical basis for the book's werewolves, but just the same the story doesn't adhere to its own rules. It's hard to say if that's the writer's intention or fiat of the artist after the fact. Percy packs a lot into Outbreak and therefore tries to say a lot, and sometimes that gets garbled; he's OK when Lukos is a metaphor for all the various differences that cause people to be discriminated against, but on shakier ground when the werewolves begin maliciously infecting people with their blood-borne and sexually-transmitted disease. I did think Percy was particularly on point late in the book when Oliver opines on hate: "Differences. Regional, religious, ethnic, political differences. That's our universal disease, as humans. Difference repels us." But the conflict between the werewolves and the "Patriots" group that hunts them is ultimately, as the book labels it, a "first world problem"; Percy's irony is particularly biting when it ends up affecting a Nigerian warlord half a world away, one who purports himself to use colonialist strategies gleaned from the West to now rule the population in Africa (subsequently taken down by the prototypical American anti-hero Deathstroke). Seeming in some respects in answer to the "Outbreak" story, Percy's Green Arrow: Rebirth special is more insular, involving Seattle and Seattle proper. As with Kudranski and Zircher, Otto Schmidt completely redefines Percy's Green Arrow, and this peppier take is much closer in tone to Dan Jurgens, Ann Nocenti, and Jeff Lemire's takes previous -- if Percy perceives himself writing the same Oliver then the artist makes a world of difference. On its face, Percy and Schmidt's story tends a bit supernatural, with the homeless kidnapped by goblin-looking "Underground Men." At the same, time Schmidt even depicts the "real" villains with a ghoulish bend, so possibly the book's supernatural will be visual and not actual, which would suit my preferences just fine. Certainly Otto Schmidt's more animated style, and Blambot's Nate Piekos's un-bordered word balloons, differentiate Benjamin Percy's Rebirth Green Arrow from DC Comics's usual fare; that didn't apparently go so well for DC You, but I'm hopeful this has more success. Based on the Rebirth special, the new Green Arrow is one I'm looking forward to. Green Arrow Vol. 9: Outbreak unfortunately didn't live up to the promise of Percy's first outing, but it seems there's better things to come.